I start with a brief introduction into Window licensing and have put together my recommended mechanisms for downloading Windows installation media and activating your product depending on your license type. There are some more in depth notes which explain in more detail how to determine your license type and explain how the activation mechanisms and if necessary workarounds work. For all intents and purposes Windows 8.0 Service Pack 1 is Windows 8.1 so anything mentioned below that applies to Windows 8.1 also applies to Windows 8.0 unless specifically differentiated. The older revision of this page got extremely popular due to previous issues where I compiled a working convoluted set of workarounds that are no longer necessary, Microsoft have simplified their Windows Deployment and hence made installation of Windows 8.1 far easier. Microsoft Windows 8.1 is sold via many different channels and there are a number of different activation mechanisms for Windows 8.1 depending on the type of license you are utilising. Volume License – You are using your organisations Volume Licensing and you should contact your IT department. The Windows 8.1 OEM license should be eligible for a free upgrade to Windows 10 for a promotional period of 1 year after its final release. Because no installation media is provided for Windows 8.1 RT (a crippled version of Windows 8.1 essentially equivalent in functionality to Windows Phone) and Windows 8.1 with Bing or Windows 8.1 SL with Bing. I do not recommend purchase of any of these devices. The Microsoft Windows 8.1 OEM licenses uses OEM 3.0 system locked preinstallation keys for activation. OEM 3.0 SLP activation inputs a unique 25 digit product key into the systems UEFI BIOS and hence has no need for a COA which have been removed due to piracy issues and due to the multiple problems users had when they peeled off or faded. In the vast majority of cases the “Home Edition” is “Windows 8.1” or “Windows 8.1 Single Language”. If your system has this sticker try downloading these two .isos and if one of the .isos takes you to the license agreement during installation you have the correct “Edition”. The “N” Editions are rare so try these only if the regular .isos don’t work. I had a look at a few shops BestBuy, PC World, Staples in the US, CA and in the UK. I checked the sticker at the base of the system and compared this with the Edition in system properties. I was looking in particular for a difference in the with Bing systems. Although all the systems have a sticker which just says “Windows 8” similar to the other 3 Editions which the Media Creation Tool Supports it was a different sticker. In the vast majority of cases the “Professional Edition” is “Windows 8.1 Pro”. If your system has this sticker try downloading this .iso and if the .iso takes you to the license agreement during installation you have the correct “Edition”. A Windows RT device has hardware in particular a processor that is non-Intel/AMD using instead Arm processors. These devices were made to compete with Chrome Books as budget devices and prolonged battery life. However in reality Arm processors do not scratch the potential of Intel/AMD processors because of the magnitude of third party applications written using either the Intel x86 or AMD x64 architectures (Intel and AMD have an agreement – Intel use AMD x64 and AMD use Intel x86). This Edition was terribly marketed and sold often by shops as Windows 8. As a consequence of being sold and marketed as a broken variant of Windows 8 with the end user seeing it as a device with Windows 8 but with nothing working, Windows RT was highly unpopular. In turn as it was unpopular, developers never felt the urge to write programs which would run on Windows RT therefore making it redundant. Windows RT is unfortunately unsupported by the Windows 8.1 Media Creation Tool and you have to procure installation media from Dell. Your Windows 8.1 Edition will be listed at the top. To find out the OEM BIOS Embedded System locked Product Key select ACPI Tables and the MSDM tab, copy down your product key. 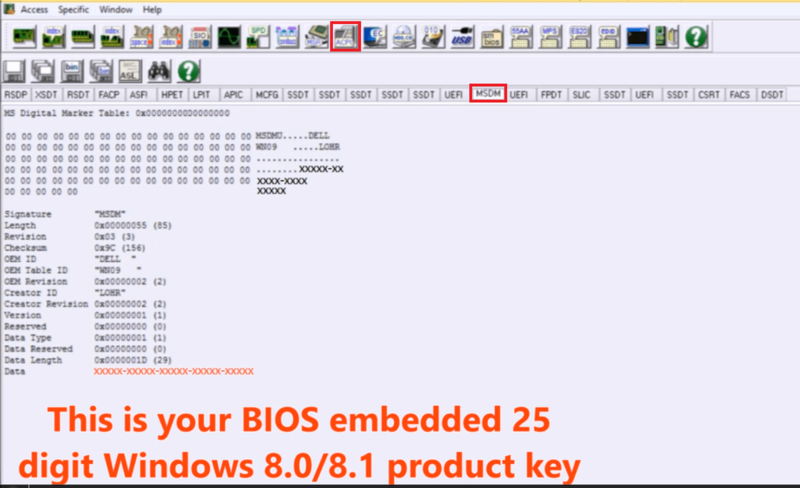 Note RW-Everything is the preferred utility to obtain your BIOS embedded product key because it will give you the product key regardless what version of Windows is installed. Other utilities can give bogus keys from the Windows registry. For example this can be important if you have downgraded to Windows 7 and wish to migrate to Windows 8.1. Could be bypassed by use of Generic Keys and Change Key after installation. Windows 8.0 involved a convoluted forced upgrade to Windows 8.1 via the Microsoft Store. This was problematic at best. The download is practically the same size as the full .iso. Windows 8.1 media with this fault did not contain update 1. The update to update 1 was also problematic. Use the Windows 8.1 Media Creation Utility to get Windows 8.1 with Update 1 Media. The Windows 8.1 Retail licenses should be eligible for a free upgrade to Windows 10 for a promotional period of 1 year after its final release. This is not applicable to Vista or XP licenses. However Windows 8.0 → Windows 8.1. These licenses will come with a unique 25 digit product key affixed to the box with the installation media or were sent to you via email. Its recommended to email yourself a copy of the 25 digit product key in case you misplace the boxed media. The Full version of the license can be installed and transferred from one computer to the other without any problems provided that it is only installed on one computer at a time. Many users have lost their installation media for their old license or didn’t get installation media for their old license if its OEM. The OEM will be unable to ship installation media for the original Windows XP license as its reached End of Life. The cost of procuring media for an out of Windows Vista system is higher than a new license. It is therefore recommended you toss any Windows 8.0 installation DVDs in the bin. You may download a Windows 8.1 .iso using the Windows 8.1 media Creation Tool and this does not discriminate between Windows 8.0 and 8.1. For the Retail Full licenses input your product key during installation and it should automatically activate online. This is easily the most understood license because Microsoft’s intended use of the license was different to the bulk number of cases where the license was used. This license is designed for smaller system builders to sell e.g. for local computer shops to purchase that build custom systems and sell them on to the end user with preinstalled Windows and installation media. Because such shops only sell a low volume of systems (compared to Dell or HP) there is no custom BIOS to include the markers for OEM SLP activation. The computer shop are meant to be the ones to support the license and since they can only support their own configuration there is the same OEM inability to transfer the license; it is tied to the original mainboard. The installation and activation for this license type is therefore more similar to a retail license. Phone activation may be required if Retail media is used for installation however. In reality however it is seen by the end user as a cheap “Retail” license and users purchased it as it was significantly cheaper than the Retail Full or Retail “Upgrade Only” licenses. Experienced end users accepted that they got the license for cheaper and their only limitation was that they couldn’t transfer the license or get Microsoft support. Naturally less experienced users also followed this trend and didn’t understand the limitations. The Volume License is essentially a volume “Upgrade Only” License although it can be utilised for clean installation. The point is organisations purchase maybe >25 or more systems with OEM licenses from Dell. IT departments will struggle deploying custom Windows installations on possibility 100’s or 1000’s of systems with OEM licenses. The Volume License gives them the flexibility to deploy Windows throughout their entire organisation without having to waste time phoning Microsoft to activate every system or separately clean install each system with a Dell Windows 7 OEM Reinstallation DVD. Hello Phil, I’m trying to do a fresh install of Windows 8 Single Language. Can I use my product key on a 8.1 Single Language? Will it work? Yes this downloader now accepts Windows 8 and Windows 8.1 keys as equal unlike previous flawed downloaders. The Windows 8.1 Single Language .iso will work with Windows 8.0 Single Language OEM/Retail key. To one of the experts, I want to downgrade from win 8 to win 7 (Ult) on my laptop. I have win 7 disk. It is not worth your time downgrading from Windows 8.1 to Windows 7 Ultimate (via a full retail license) at this stage. In Late Summer Windows 10 will be released and Windows 7 and 8.1 will both be auto-updated to Windows 10 as a free update. Using 2 Windows licenses for a system to get Windows 10 is not worthwhile and its not worthwhile performing the downgrade for only a “few” months use. Both Windows 7 and 8.1 will be realistically obsolete once the majority of the userbase has migrated. You can install Windows 10 Technical Preview at present but should be aware that it will have bugs. There is also the fact that Dell are not providing new Home Inspiron systems with Windows 7 compatible drivers so you may get limited functionality in some cases. You have to make some adjustments to the UEFI BIOS setup such as disable SecureBoot, enable UEFI, convert your installation media into FAT32 UEFI Bootable media for the GPT partition scheme, enable USB Debug (disable USB 3.0 functionality) in order to accomodate a Windows 7 install. Windows 7 has >200 updates to install so updating takes longer than the Windows install. sir my windows does not show activated after i use data recovery function by pd ………………….. Explain what you did in detail, provide model number, version of Windows and its better to post on the Dell Community Microsoft OS Forum opposed to the comments here. Try Windows 8.1 and Windows 8.1 Single Language. The correct Edition will not ask for a product key and take you straight to the license agreement screen. The incorrect edition will ask for a product key. Does updating windows from 8 to 8.1 changes the OEM product key in BIOS? I am asking this question because I’ve got 2 directories in windows registry, viz., “HKLM\Software\Microsoft\Windows NT\CutrrentVersion\DefaultProductKey”, and “HKLM\Software\Microsoft\Windows NT\CutrrentVersion\DefaultProductKey2”. But I don’t know if they were already there before updating windows. The product key in the UEFI BIOS cannot be changed via software as it would be a disaster if it could. Updating from the store sometimes gives you another key which is useless and hence throws out many programs which look to the Windows registry for the product key. Its a reason why I recommend RWEverything which looks at the hardware and not programs like Berlarc Advisor which look at the registry for the product key. Install RWEverything and had a look at ACPI Tables and see if there is a MSDM tab and Windows 8.1 product key. I am not an Acer expert, I can help even less without knowing the model number and if Windows 8.1. I have a Dell latitude 3540 which I bought secondhand, It came with Windows 8. 0 Enterprise, which I couldn”t be updated to 8.1. When called Microsoft and gave the key from the Bios, they said that it was an legit key, but that it was for Windows 8. pro. They even sent me a reinstall disk for 8.1 (I paid $15 for it.) But when I tried to use it, it wouldn’t accept the key. And when I called Microsoft back, they said that that’s because it’s a dell machine–I told them it was dell machine before I bought the disk–and that I needed to call dell to activate it. So when I called dell, they refused to sell me a ‘usb key’ which they implied would solve the problem, because I couldn’t give then the proper information about the previous owner. (The machine was still under warranty.) They asked me to fill out a form and then made me wait a week. Anybody have any ideas? I really don’t want unupdatable 8.0 enterprise, which Microsoft say doesn’t exist, on this machine. Is there any way I can get back to 8 or 8.1 pro without buying a full license. Microsoft made mistakes with Windows 8.1 installation media initially in that it blocked Windows 8 keys. Your $15 was wasted. Thanks Phillpyip, I’ll have a look. There’s a new wrinkle. Dell won’t send me a reinstall disk, but they say that this computer was downgraded to Windows 7, and so that the key that I have should work for Windows 8 or 7. Is that possible? I was told that if I can get a hold of Dell reinstall disk or usb for 7 or 8, that it would work–and not even ask for the key. Is that right? And won’t I have to get Microsoft (by phone) to activate it after the install? Who to trust. I looked at the page. I could try it. Unfortunately I don’t have a decent internet connection. So I’d have to go s somewhere else for the download. Would this also work? The key given by RWEverything? This guide doesn’t support pirated Windows…. The question is. My computer was supplied with OEM (Dell) Win 8.1. I was so P`d off I reformatted and loaded Retail copy of Win7. However I have upgraded the win 7 on to my wife’s Vista computer. In theory I STILL have a valid Win 8.1 entitlement to and upgrade to 10. How do I access it? The upgrade to TH1 requires an upgrade install unfortunately. You could of course upgrade to Windows 10 TH1 using your current Windows 7 license but its a waste of a license; better to consume your Windows 8.1 OEM license for the Windows 10 Upgrading freeing your retail Windows 7 Upgrade license for your older machine. TH2 is much better than TH1 and will allow for a direct Clean Installation. My advise is to wait until TH2 is out on the main track before upgrading to Windows 10. Forgive me if this question was already answered. I have a dell Inspiron 7720 laptop purchased second hand with a failed hard drive. I dont have the original windows 8 key that it came with. I also was unsuccessful retrieving it from bios using software like rwEverything, etc. I cant get OEM installation media from Dell because this computer is not registered to my name and I cant get in touch with the original owner anymore. Frankly, dont really want to pay for the installation media anyway. Is there a way for me to find out the original windows 8 key? that I could then use to perform a clean install of windows 8.1 and windows 10? RWeverything gives no MSDM tab? The official answers are either 1. Because the key is classified as part of the hardware you need to either replace your motherboard (if in warranty get Dell to do so) or 2. Buy Windows 10 as a Retail License. Some of the 7720s would have been old with Windows 7 and not Windows 8 or Windows 8.1 and hence will not have a MSDM tab however so look for a COA under the battery just in case. There is still an official windows 8 sticker on the back. As well as a plane white sticker with partially faded “Product Key” that looks like a windows key to me. I cannot decipher some of the characters in it though. I also read in other forums online that Dell laptops (at least a few of them from the sound of it) don’t seem to have MSDM tab and tools like RWeverything fail to work. Does the system have UEFI BIOS revision A17? If not update and try RWEverything again.